Fender Jazzmaster Classic Player, its tune-o-matic, tailpiece, and frets. One of these was brought to me for a fret dress. It’s not a bad guitar! It’s lightweight and the neck felt really nice – skinnier than my USACG Jazzmaster, whose C profile neck is actually a little chunkier than Fender’s C. I mean Fender’s neck are all over the place, but mine seems chunkier compared to most Fender’s C.
As a rule of thumb, I like lubricating all bridge screws of a Jazzmaster. It actually helps them stay in place and they’re easier to work with that way. So I was set to remove the intonation screws from the bridge. Starting with the high E, I kept turning it but it wouldn’t come off. Eventually, the head broke off, and I realized (with some googling) that there’s a little C ring that sits between the side of the bridge and the saddle. To remove the screw, the C ring needs to come off. It’s easy to remove them with a dental pick (and put back with skinny tweezers). Finding a replacement screw where was the fun started. These Tune-O-Matics look like a Nashville variant, but they have a 9.5″ radius, and they’re made in Korea. Being made in Korea usually implies the threading is metric (and I don’t have one of those things to see what threading it has). I went to a couple of guitar stores here to see if they have a replacement, and they didn’t. I called Fender to ask if they sell replacements, or know where to get any, but they buy the bridge assembly as a whole, so the only way to replace the screw is to buy a whole new bridge. Those are $8 on eBay with free shipping from China, which is mind-blowingly cheap, but I promised the guy to get the guitar done before his next practice. Since I couldn’t verify that the screws are actually metric, I decided to bite the bullet and ordered a set of screws and a set saddles from Stew-Mac. I figured that if the new screw won’t fit in the existing saddle, then I can replace both saddle and screw. The Stew-Mac screws fit the saddle, but they’re a hair shorter than the original screws, so they don’t fit in as tightly. They are functional though, so I wouldn’t mind using them again. So if you read this and need a replacement screw, either get a whole bridge (and maybe those ones on eBay do have metric threading? ), or go ahead and get some from Stew-Mac. The tailpiece on these guitars is the usual shape of a Jazzmaster tailpiece, but the arm is threaded into the socket, as opposed to just being pushed in. I know some people have bad experience with their tremolo arms where they fall out or keep swinging, but that’s probably because they don’t push it all the way in, or they use import parts which I believe aren’t made with the same accuracy that the US parts are made with. Anyway, the arm moves in the socket a little (even when threaded all the way) so it rattles, which is annoying, but it’s also not as sensitive as the original. Now the Tune-O-Matic seems like another fix people are into, but not me, and definitely not this TOM. I never noticed it with other TOMs, but the intonation screws move back and forth. They just sort of pop away from the bridge a little bit (but don’t come off completely, because of the C ring). I don’t know if it’s because of the tremolo rocks the saddles, or just a bad design, but it’s a thing. This means they rattle (which isn’t a big deal because it’s not heard through an amp), but worse, it makes it go out of tune. The last gripe I have with these guitars is that the frets seem to tarnish quickly. I leveled, crowned, and polished the frets and they looked like a million bucks. Then I put strings on and played it a little, and I noticed these scratches along the frets. It’s not the strings that caused it, because my JM has 12-52s and its frets still look like new. My guess is that they use a higher ratio of soft-metal to nickel in those frets. TL;DR – Nashville style TOM intonation screws would work on these TOMs (like those available from Stew-Mac). The rhythm section knobs (roller knobs?) take 16/32″ hex screws. I thought they’ll be metric, but they’re not. Tremolo arm is threaded which makes it not sit tight in the socket, and it’s not as sensitive as the original. TOM intonation screws don’t sit tight in the bridge, so there’s rattling and the guitar goes out of tune a little (I don’t think loctiting would work, nor do I like doing that). The frets are a little soft and tarnish quick. Otherwise it’s a pretty great guitar. 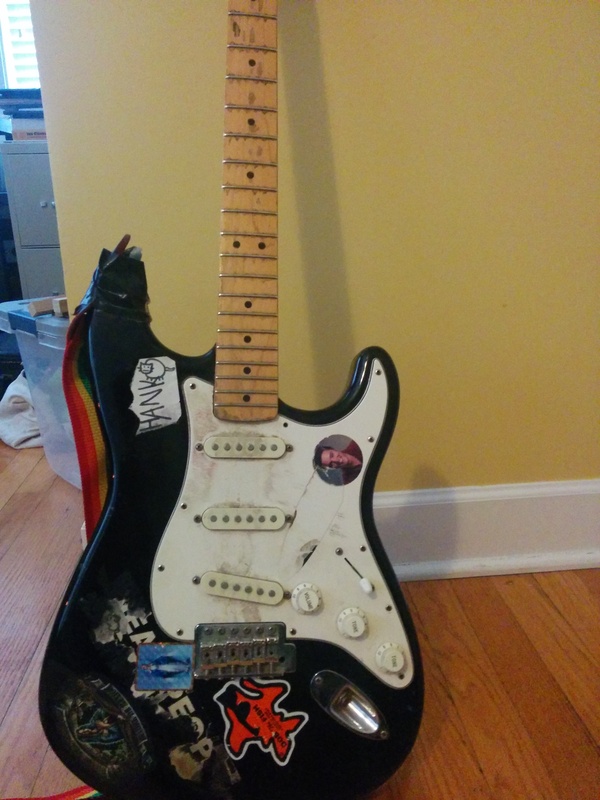 This guitar belongs to a friend of a friend, and it was the best strat I’ve had the chance to play. Maple neck and fretboard, super hot pickups that were the best sounding strat PUs I’ve ever heard (even the duck mode was great), and just really fun to play. That guitar has been through a lot – the guy owned it for 20 years, and I don’t think it’s ever been setup or cleaned. It was brought to me on a cold day without a case, and it was perfectly in tune (sans the high e string). Look at what it looked like when I got it. The guy asked for a new nut because the original was chipped (reparing it wasn’t going to work), and I decided to go ahead and dress the frets. The first 5 frets had some deep divots, and I knew that would affect how well I can set it up when I’m done. The fret ends were also sticking out like crazy, so I had to take care of that as well. I didn’t charge him extra for the dress, because we didn’t agree to it prior, and I figured it’ll give me a chance to practice fretwork. The fret dress went really well with two exceptions. The first is that the masking tape was pulling some of the lacquer (poly?) from the fretboard. I use drafting tape which is low tack, but it still lifted some of the finish, particularly in areas where the fretboard was already worn out. The second thing I wasn’t 100% happy about is how I finished the fret ends. I tried to replicate the triangular fret ends like they have on Santa Cruz guitars, I don’t have the right technique for it. I think they use bigger files so they can always keep the cutting angle constant. Mine kept changing, and therefore the triangles went from being isosceles to kind of skewed one way or the other. It looked ok though. I’ll do better next time. This nut was a breeze to make. 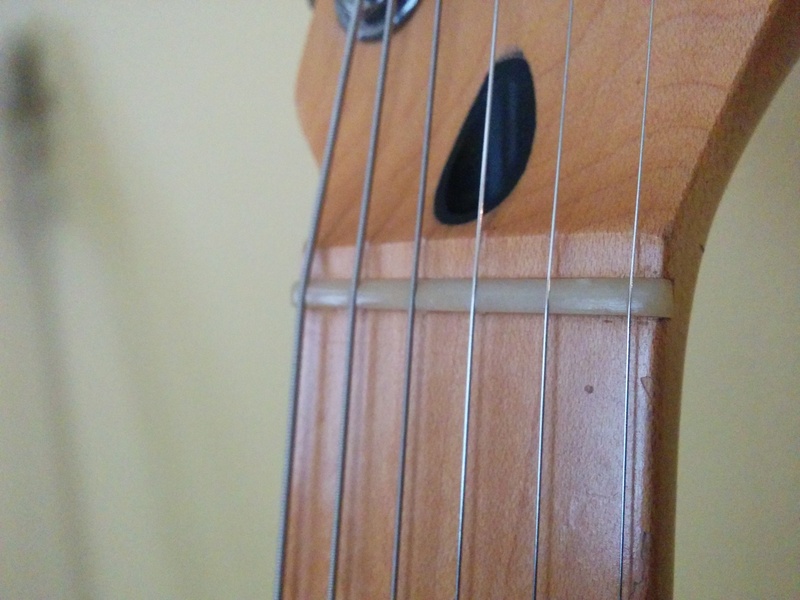 I didn’t blunder trying to compute the right string spacing, and I finally realized that using files to roughly shape the nut makes a lot more sense than doing it all with sandpaper. I do, however, really need to get a nut and saddle shaping vise. The only grief I had from this guitar is that I broke 4 high e strings (010) in the process of setting up/shaping the nut. That was a combination of two things. 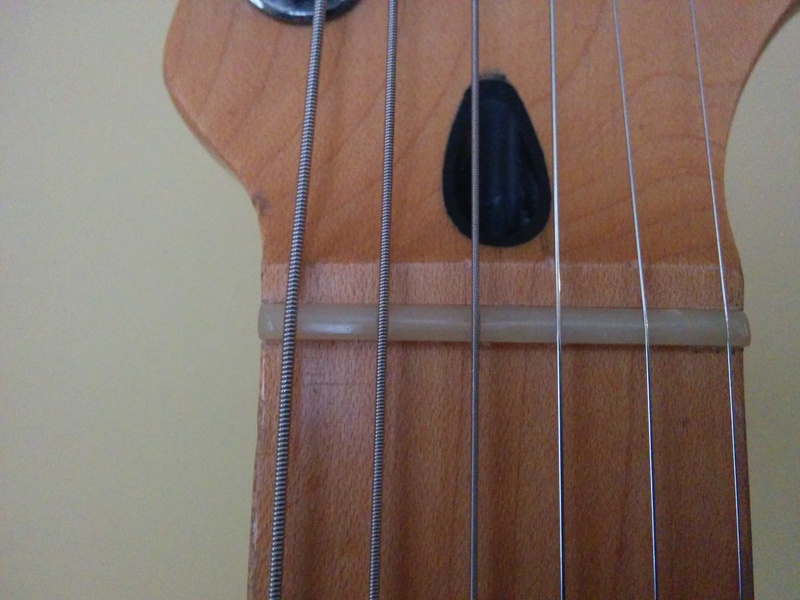 One is that there was a little ridge on the tuning post, and the string kept getting caught on it and break. The other is that as I was making the nut, I didn’t sand down the high e string area very much. In other words, while the slot was the right width, it was very deep, and kept binding in the slot. Of course, I was going to remove all that excess material at the end, but I now realize that it’s good to remove the material as you go. Lastly, I decided to try a new way of gluing in the nut. On a previous job (one of my guitars), I put a drop of Titebond under the nut and string the guitar to pitch. This time I put the nut in place, strung the guitar to pitch, and put a drop of superglue right where the fretboard meets the nut. I let it dry and then scraped it with a chisel. If it weren’t a finished fretboard, I would have wiped it off with acetone. An aluminum neck might be a whole different deal, though. Here’s what the finished nut looked like (forgot to take pictures of the fretwork).